Planets Transit The Desert In 7-Mile Scale Model Of The Solar System : The Two-Way In this solar system, Jupiter is about the size of a miniature watermelon. The sun is a small weather balloon. And the orbits, traced onto a dry lakebed, are huge. 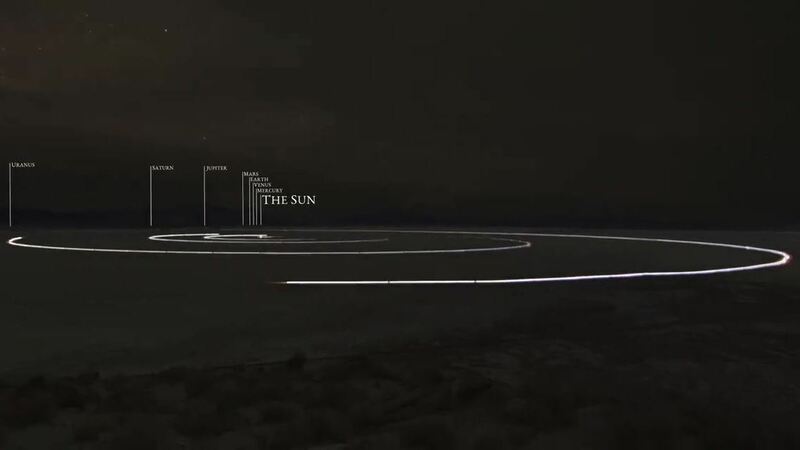 A still image from a video produced by the To Scale Series shows a model of the solar system in which planets orbit the sun on a dry lakebed in Nevada. "The only way to see a scale model of the solar system," Wylie Overstreet says, "is to build one." So he and a group of friends did just that, tracing out the planets' orbits and then filming a time-lapse video from a nearby mountaintop in Nevada's Black Rock Desert. "Every single picture of the solar system that we encounter is not to scale," Overstreet says in a video about the project. "If you put the orbits to scale on a piece of paper, the planets become microscopic, and you won't be able to see them." Those proportions are kept honest in the scale model, in which an Earth that's only the size of a small marble calls for a solar system that's 7 miles wide. In this solar system, Jupiter is about the size of a miniature watermelon. The sun is a small weather balloon. A video of the huge (but shrunken) solar system has attracted more than 400,000 views since it was posted on the To Scale Series Facebook page. A companion video shows how the model was made, with cars tracing the planets' orbits onto a dry lakebed. The goal is simple: to get a sense of how tiny our world is, in relation to space. "There is really not an image that adequately shows you what it looks like from out there," Overstreet says. The video blends the sublime — filmed at night beneath a starry desert sky, the planets' transits show how vast even our little corner of the universe is — with the practical. In one sequence, Overstreet has to fish around for the right marble that represents Earth. "I have the world in my pocket somewhere," he says.